Chennai has the dubious distinction of recording the highest number of suicides among mega cities in India. Depending on the age demographics the success in suicide is about 30 : 1. (Meaning that out of 30 people of attempt 1 succeeds) This actually the mammoth size of the problem. So for every 1 death reported 30 more are actually mental health issues. According to statistics from the Health Department, about 858 people committed suicide in Chennai in the year 2016-17. (Read: Causes of Death in Chennai). 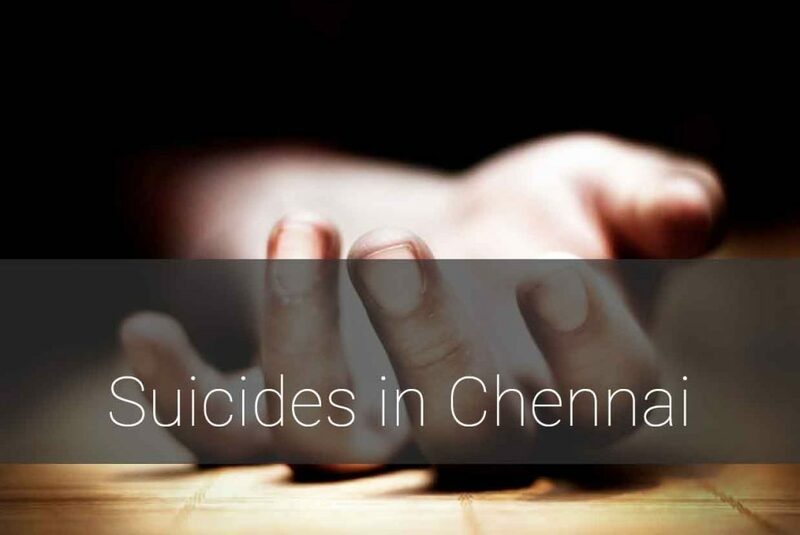 Suicide is the ninth highest cause of death in Chennai. Chennai also recorded the highest number of suicidal death on 2012 across India. Male Suicide rate is double than women. In 2015, the Health & Family Welfare Department of Government of Tamilnadu initiated the 104 helpline to curb the growing number of suicide cases. Students especially who feel stressed after exam results were encouraged to call. According to a senior official of the call center “The Center has prevented thousands of suicides since its launch in the last 3-3 years, but more work needs to be done” accepts the senior official. Section 309 of the Indian Penal Code lays down the punishment for attempt to commit suicide. According to the law: Whoever attempts to commit suicide and does any act towards the commission of such offence, shall be punished with simple imprisonment for a term which may extend to one year or with fine, or with both. Many attempts have been made to remove this section of the law on various grounds. However, the parliaments has not been able to pass a law to annul this section of the law. Even though the section has not been removed, the Mental Healthcare Act, 2017 and Rules under the act have effectively decriminalized attempted suicide with effect from July 2018. Further more, The Mental Healthcare Act 2017 aims at decriminalizing the Attempt to Commit Suicide by seeking to ensure that the individuals who have attempted suicide are offered opportunities for rehabilitation from the government as opposed to being tried or punished for the attempt.